Designed by the Netherlands-based Lab32 Architects, this incredible villa is the modern dream. Based on 650 square metres of property, this home is clean, sleek, contemporary and classic all at the same time. And these are architects who know what they are doing! 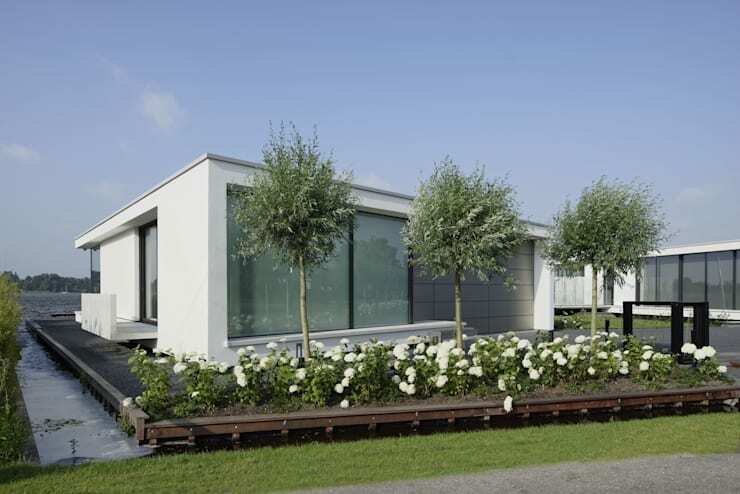 They have designed several other homes, including Droomhuis Met Ambylight, the Bungalow in Bilthoven and the Eigentijdse Bungalow. All of their projects are incredibly smart and sophisticated. This is also functional design at its best! This particular home is based on a lake, so you will notice that the architects have done their best to include the surrounding views and beautiful landscape into the design, ensuring that it can be seen from just about any angle. So let us go and admire their handy work! 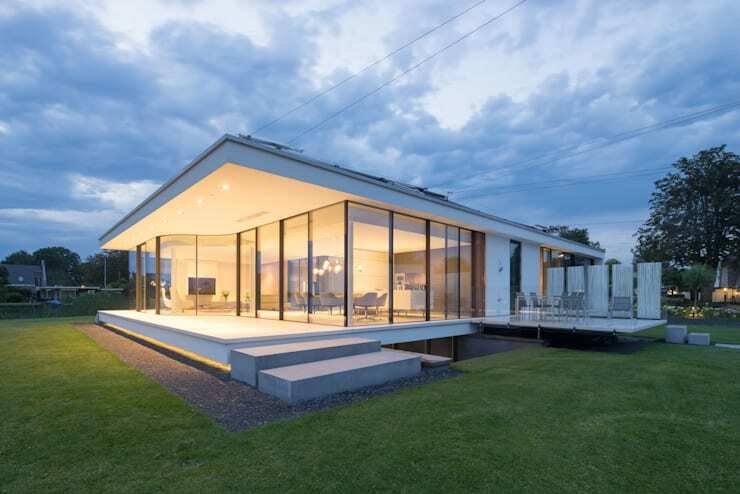 The first view of this gorgeous Lake House shows us how the clean lines and modern structure work together to create something quite phenomenal. Glass windows encase the entire front side of the house, allowing for constant access and sight of the views beyond the house. The transition between interior and exterior is flawless. The structure is simple, yet sophisticated and effective. White and grey are prominent, neutral colours, which create a very suave and understated look, working beautifully with the glass. This makes the glass walls stand out as the focal point of the design. Neutral colours are a fantastic choice when it comes to exterior colours. You want your home to look elegant and subtly smart. If you like funky design and trendy, bold colours, then you can always opt for a bright blue, red or yellow front door. The bottom line is that the exterior is the first impression of your home—and you want it to be wow! If we move around to the side of the house, we can see the attention to detail, where the designers have thought every last thing through. The house is lined with beautiful rose bushes, manicured perfectly and interspersed with beautiful trees. The state of your garden and your verge is incredibly important because it provides a natural decorative element and can mean the difference between a beautiful, attractive home or a home that looks like a run down dump. Make sure yours isn't the latter! Check out these: Home Borders That Offer Style And Privacy. This angle also allows us to see how the home is raised above the ground on a dark wood platform. This almost gives the impression that the house is floating, which works beautifully with the lake in front of it. We love that it almost looks like this is a house boat, floating above the lake! Moving into the interior of the home, we can see how white is a prominent theme throughout. Clean, minimalist and sleek—this is the epitome of modern style. You'll notice that everything is white—the tiles, the walls and the furniture, which looks beautiful and light next to the glass windows that feature throughout. The designers have added a touch of colour in the form of a small pot of flowers and greenery. This is subtle and beautiful, creating a very understated and attractive touch of décor. This is a great tip for any area in your home. Pair neutral furniture and colours with a beautiful pot plant or a vase of flowers. Look through homify's range of fantastic products for corridors, hallways and stairs for some inspiration for your own home! If we move into the living room we can see the white theme continues, but the designers have included a gorgeous purple rug that adds a light little touch to the room. Don't you love how elegant and sophisticated this is? The beautiful and expansive glass windows reveal the fantastic views of the lake, which also lets in an abundance of light. Natural light is always a wonderful decor element. It's healthy, far more environmentally friendly and, as you can see, absolutely beautiful. Thanks to the abundance of natural light, you'll notice the architects haven't needed to install too much artifical light in this space. Down lights have been placed in the roof, which provides this space with a beautiful and wonderful ambiance and atmosphere in the evening. As the sun goes down over the water, this the most incredible space for drinking tea or having a sun downer! The kitchen is one of our favourite parts of this space—neat, clean and sleek. Don't you love the breakfast bar, where you have the most fantastic wide, flat surfaces on which to prepare food, toss salads and cook? This style of kitchen is perfect for socialising! The chef can cook up a feast while chatting to the guests—the conversation can go on! Mom and dad can also share a glass of wine over the breakfast bar or keep an eye on the kids while they do their homework at the dining room table, while they are preparing lunches. This is a fantastic style! Don't you love how the ice white dining room table is frosted with classic grey dining room chairs? Grey and white are always a fantastic match! The final room on our tour is one of our favourite rooms—the pool and jacuzzi area! Luxurious and comfortable, this is the space where you can unwind, have a swim, soak in the jacuzzi and have some quality you time! The designers have ensured that peace, tranquillity and Zen are the name of the game in this home. Living by the lake is meant to be calm and revitalising. White continues as a theme in this room, while glass is also a dominant material. The designers have included a colourful piece of artwork in this room as well, creating a really trendy look and feel. Stylish meets comfort meets fashionable. This is the type of home that anyone would feel happy and relaxed in, with incredible views, cutting-edge architecture and attention to detail. If you enjoyed touring this home, we're sure you'll love: The House of Simple Sophistication. Are you a fan of minimalism? Could you live in a home like this? We'd love to hear your thoughts!